This idea of doing one thing, and doing it extremely well, is not often seen in Miami, at least not in the restaurant world. Miami is the land of the "Pan-Asian" eatery, full of places serving up Korean-Thai-Japanese-Vietnamese amalgams aimed to please all palates. It's the home of the Thai/Sushi joint, a merger inexplicable from a culinary basis, but mind-bogglingly ubiquitous around these parts. So many Miami restaurants try to be everything to everyone, and wind up doing precisely nothing very well. You can't get sushi at Momi Ramen. Nor will you find tempura or teriyaki, pork buns or pad thai. 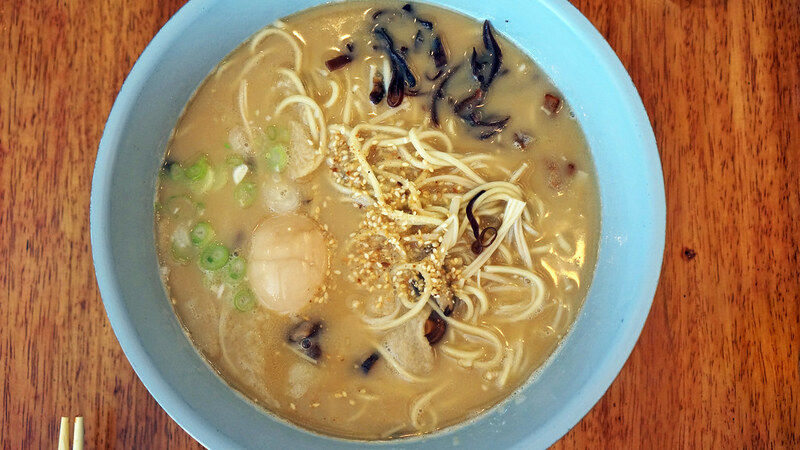 Chef and owner Jeffrey Chen just wants to make ramen. And that's pretty much all that's on the menu at his restaurant, with about 25 seats and a glassed-in kitchen all tucked into an old house in the Brickell area off Miami Avenue. Though the ramen "trend" could be close to celebrating its tenth birthday in New York, it had been slow to make its way south to Miami. 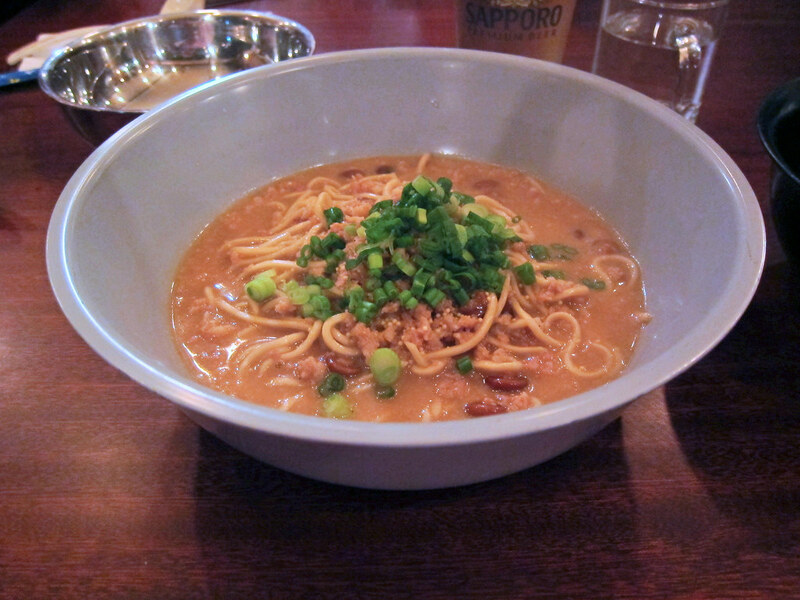 There have always been a few places where you could get a bowl of the hearty noodle soup - Hiro's Yakko-San offers a few different types, as does Su Shin Izakaya. And more recently, a few of the "next generation" Asian places have tried their hand at it - Gigi and Pubbelly both have their versions, Makoto actually does a very nice Taiwan style ramen with ground beef and a chile-infused broth, more recently Bloom and Shokudo trotted out their own takes. But none of these places claims to be a ramen specialist. Momi is something different entirely. Chen makes his own noodles several times daily. He makes a rich tonkotsu broth that takes most of a day and night to prepare. And each day he serves about a half-dozen variations on the theme of noodles and broth, assembled from a very short list of carefully chosen ingredients. If you want variety, even among ramen styles, this is not the place to go. Indeed, rather than expanding the menu since Momi opened about a month ago, it's been pared back. Though the choices change a bit every time I've been in, that hearty tonkotsu broth, a slow-simmered pork bone stock that gets a creamy, lip-sticking, almost gravy-like consistency from the marrow in the bones and the conversion of collagen to gelatin, is at the heart of almost all the bowls offered at Momi. If you ask me? That's just fine. Because there is a level of craftsmanship and attention to detail at Momi that has few peers in Miami - at any type of restaurant. 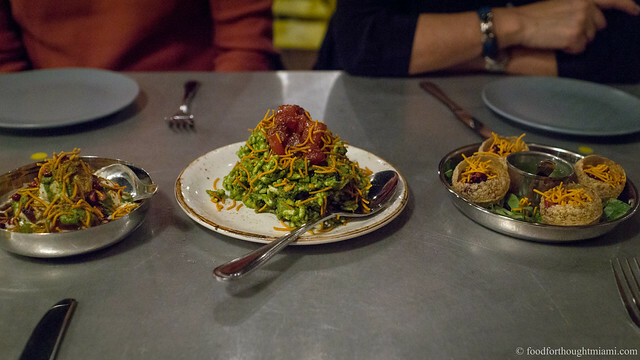 Momi's approach may be old school, but its menu is not entirely hide-bound. 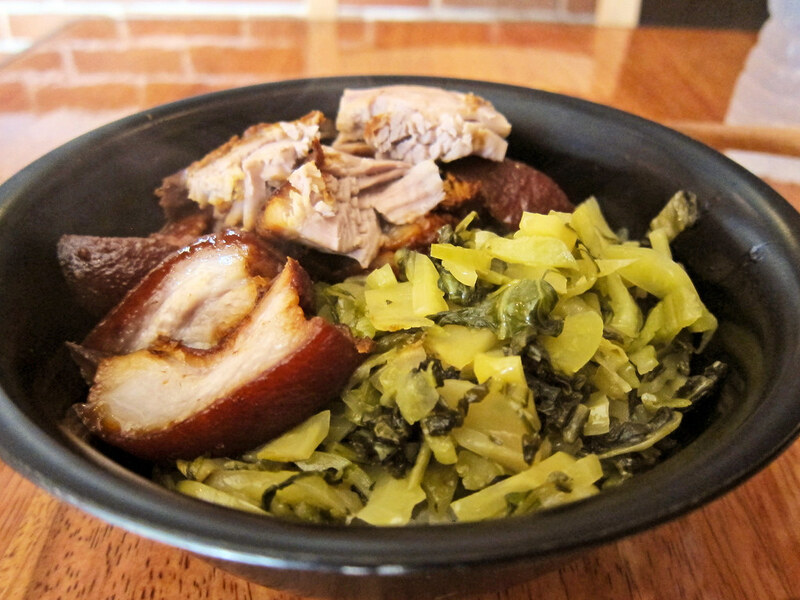 Some dishes are fairly customary, others more unusual and creative. Perhaps the most traditional of Momi's ramen lineup is the pork belly tonkotsu ramen: noodles swimming in that hearty tonkotsu broth, fat slabs of tender roasted pork belly draped on top, maybe some pickled bamboo shoots, a perfectly cooked hanjuku egg with a solid white and a barely runny yolk, and a shower of green onions. But let's not talk about the components and ignore the star of the show: those noodles. Now, I will confess that I've not been to any of the ramen "temples" of NY or LA, much less to the source in Japan. I'm not in a position to draw comparisons or vouch for "authenticity." I can only tell you that these noodles are just delightful to eat. 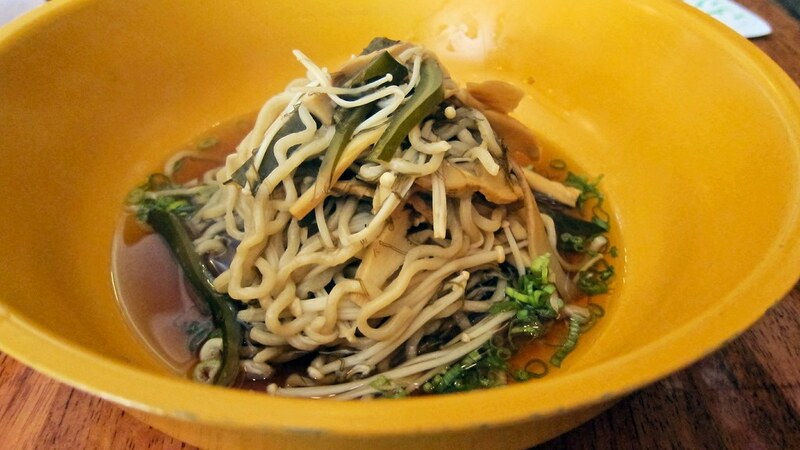 They have a simple, "wheat-y" flavor, and a tensile resilience that gives them a pleasing bounce and chew that holds up in the steaming hot broth. Though different in texture and flavor, they give every bit as much pleasure as great freshly-made Italian pasta, if not more. Several other menu items are different takes on the same theme, like a Goldberg Variations of tonkotsu, pork and noodles. The tan dan mien, a Japanese twist on a Sichuan dish, features a thicker version of that tonkotsu broth, reduced to a gravy-like consistency, along with minced pork belly, little nameko mushrooms, and a dose of intriguing marine complexity from mentaiko (marinated pollock roe). Add some chopped chiles preserved in oil if you want to up the spice level. It's like eating a spaghetti bolognese from a parallel universe. Possibly even better is the nameko takana ramen, which adds pickled mustard greens to the equation for some welcome contrast to the richness of the tonkotsu broth and the minced pork. Right now it may be one of my favorite meals in town. If the tonkotsu is too heavy for you (and it is definitely rich stuff), there has been a vegetarian ramen available on each of my last several visits. Though Chen has been reluctant to expand his offerings, if the vegetarian ramen I tried is any indication, he shouldn't be so worried. It was fantastic. It's not swimming in broth so the noodles can really shine, along with softened kombu (which the server explained that the chef harvested himself in Japan), menma (bamboo shoots), fresh enoki mushrooms, and scallions. The broth, a kombu dashi made from white kombu (loaded with glutamates) and okra juice, was a delicate, translucent yang to the yin of the hearty tonkotsu, but still had a serious umami punch. 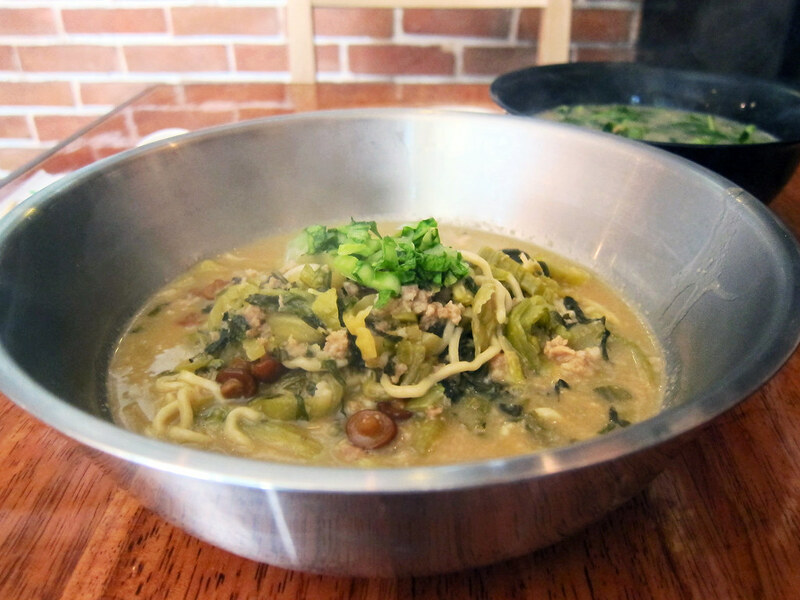 Other noodle options have included curly te-momi ramen noodles served either with slow-roasted oxtails, or plain (no broth) dressed with sesame oil and green onions. And if you don't want noodles at all - or if you'd like something in addition to your bowl of ramen - there are a few other choices of "okazu," or side dishes, too. Steamed rice is often topped with some combination of the other kitchen staples, here, pork belly and takana. 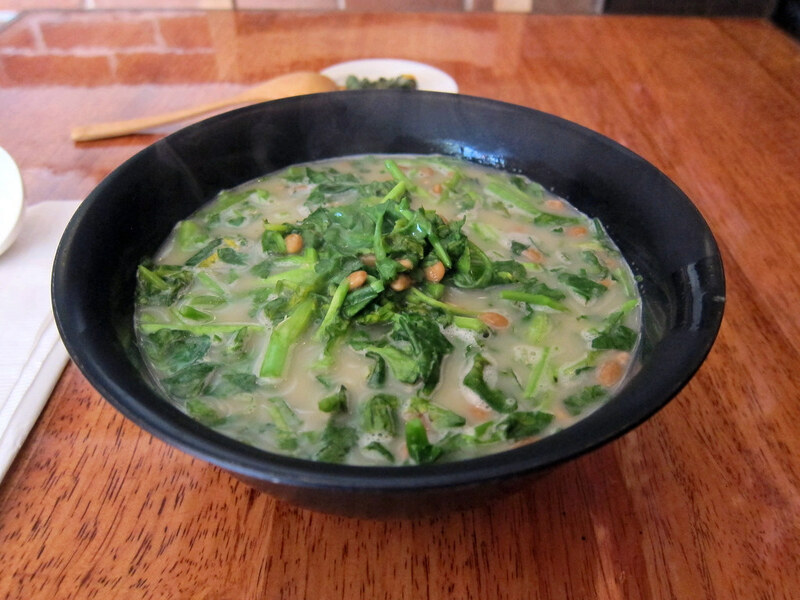 There's usually some form of leafy green, like mustard greens in shoyu broth, or watercress with natto. Or if you're a true marrow fetishist, you can get an order of marrow bones doused in tonkotsu broth. There is Sapporo beer on tap, and a selection of at least a couple dozen sakes (with an informative list that explains the styles of each of them). If you want dessert, go across the street to Gelato Nostro. Those people who think ramen comes in packages to be warmed in a microwave and eaten in their dorm rooms, or even those looking for a ramen joint offering cheap convenience food, will experience sticker shock at Momi. The bowls are mostly in the $18-22 range. It's not cheap, but anyone begrudging these prices needs to consider what they pay for a pasta dish made fresh in-house at an Italian restaurant, then ask themselves why a product made with the same attention to detail and ingredient quality should be any different. I've talked a few times to Chen but have had little success extracting his back story, other than that he spent time in Japan, most recently Hokkaido, before opening Momi, and that he really just wants his food to speak for itself. He declined an interview with Miami New Times, and asked not to be photographed for the Miami Herald's review. There's a fascinating combination of pride and humility at work here: pride in the product he creates, humility to recognize that it takes time, hard work and patience to perfect. It's an attitude that many aspiring chefs and restaurant owners would do well to emulate. This is the kind of place that really excites me. I would happily trade a dozen restaurants, each trying to do a dozen different things passably well, for one place that strives to do one thing perfectly. Ironically, ramen is itself a culinary mongrel. The dish is thought of as Japanese, but it came there by way of China, and its popularity in Japan took off when the country began importing massive quantities of flour from the U.S. after World War II. And while Momi is a ramen specialist, I should add that you will soon find yakitori next door in another space Chen is building out. I'm not quite sure what to make of Machiya, in Midtown. 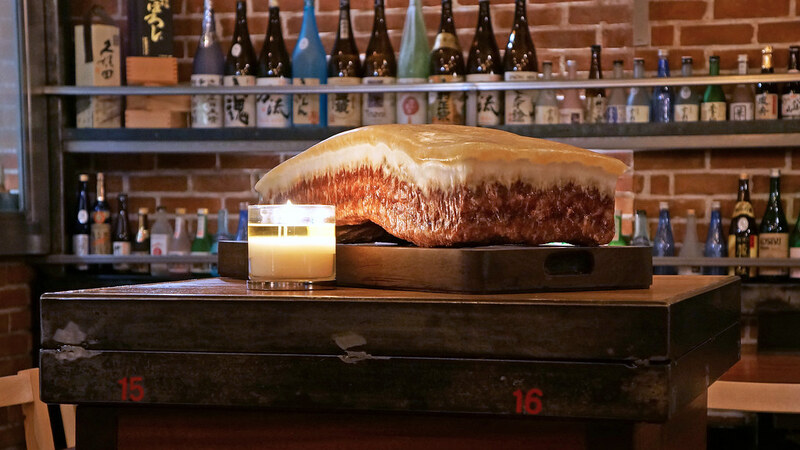 When they first opened they pitched themselves as a ramen specialist, with a menu that appeared to be lifted directly from Ippudo in New York. But only a couple months after opening, they took the ramen entirely off the menu, and added sushi. Now it appears they've started serving ramen again, but are bringing in their noodles from Japan rather than making them in-house "because the wheat flour is better than America." This bit of gibberish (and several others) were passed along by Miami New Times without scrutiny, even though 90% of the wheat in Japan is imported, mostly from the U.S.
 Actually, not quite each day. He's currently closed Mondays and Tuesdays, because he's still in the process of training a kitchen crew to prepare everything to his standards, and won't open seven days a week until he's confident it will be done right. Update: as of mid-February 2013, Momi is now open 24-7. During one lunch, he told me he's currently sticking primarily with the tonkotsu broth because he's still training cooks to prepare the other broths to his liking, and if they don't get it right, he has to throw the whole batch out. He said this like someone who has done exactly that, more than once. These fermented soy beans are perhaps best known for their funky aroma and mucilaginous texture, but when used in a broth, as here, just add a depth of flavor similar to anchovies or fish sauce. And note as well: on my last couple visits, it was cash only, no credit cards. Amazing spot indeed. 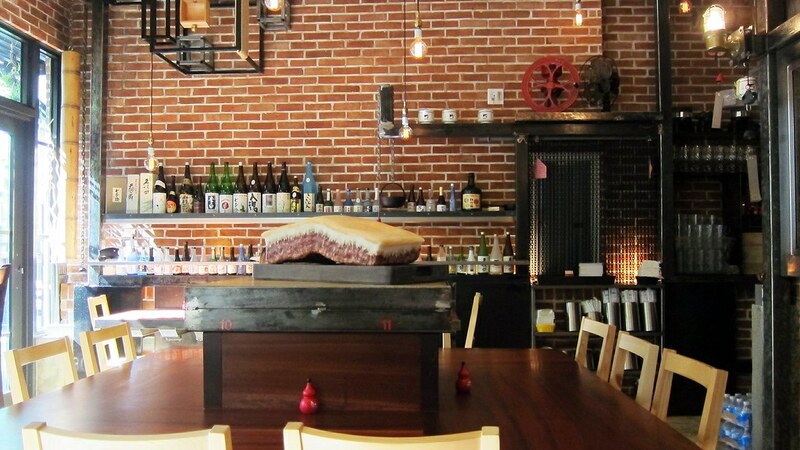 Another not too shaby option for Ramen in town is Maido in Doral. Not close to Momi but decent. I has never tried ramen quiet like this, it was perfect.. The price was a little steep but for a perfect bowl it was well worth..
+1 on the previous anon's comments. I felt the exact same way. Maido's ramen is simple Japanese style cooking for locals and the businessmen who crave a taste of home. Momi is a sort of creation with deeper, Brickell wallets in mind. Give me Maido. Never had Maido's, but Matsuri has a white ramen bowl that is VERY respectable. Having said this, Momi is best in show. A very unique restaurant- especially for Miami. The review is right on the money. 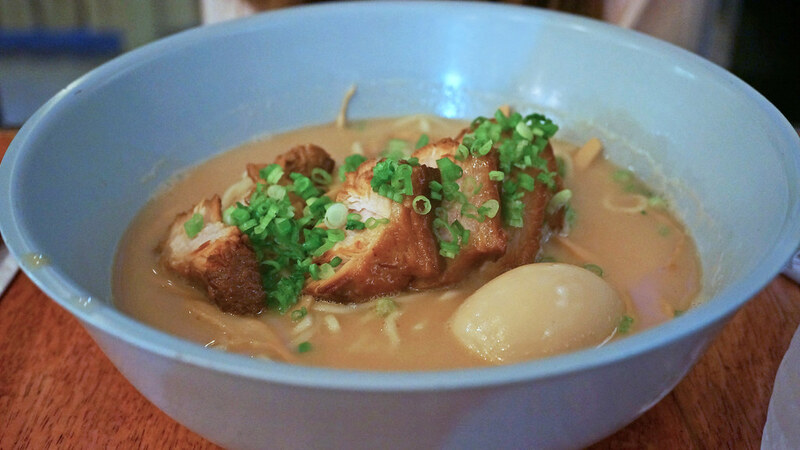 This is ramen done to a new, super-high standard. The Tonkotsu broth is like going to heaven, and the melt-in-your-mouth pork strips are the most amazing I have EVER tasted. Yes, it is expensive, but you need to treat yourself to this. It is exquisite food, and extraordinary preparation for this place of fast, mass-produced dishes..